Originally known as EX 146, the R type Midget was quite revolutionary. 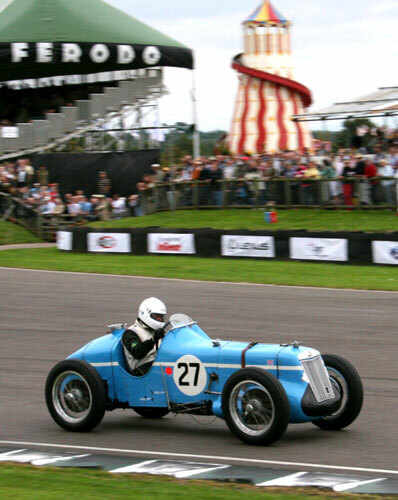 This new MG was the first British car to feature all-round independent suspension, as well as being the first MG to be offered for sale built as a single seater racing car. The engine and gearbox were virtually identical to the Q-type racing car, although close ratio gears were used in the preselector gearbox. A Zoller supercharger, was employed as on the Q type compressing to 24psi. The suspension and chassis were the really far-reaching aspects of the design. The suspension was by torsion bars with Luvax hydraulic shock absorbers. Steering was unique to the R type made by Cam Gears of Luton, which employed two gears driven by a single gear on the steering column. These gears were “keyed” directly onto the arm of each side of the car which relayed movement of the steering wheel to right and left-hand front wheel independently. Another major change was to adopt Girling brakes, in place of the Alford & Alder systems used previously although the actual operation was still by cables. The gear change selector was placed to the left of the steering column under the steering wheel in the position this control is more commonly found, and enabled the driver to select gears without removing his hand from the steering wheel. Many gauges adorned the dashboard, with tachometer, water and oil thermometers, oil pressure gauge, and fuel pressure and supercharger boost pressure gauges. A very attractive single seat body graced the car with a full cowl to cover the radiator and supercharger, with a distinctive MG grille on the front. The car came equipped with the double Brooklands exhaust system and like the Q-type it was hardly a silencing device! The new model featuring the chassis, and called the R-type, was announced to the world in the April of 1935, and cars were immediately available for customers to use in the International Trophy Race at Brooklands. Priced at £795, the car offered fantastic value and the first nine of cars were sold as soon as the model was announced with the well known Captain George Eyston alone placing an order for three cars. Suspension: Independent on all four wheels using equal length wishbones Luvax vane dampers all round. Steering: Bulkhead mounted steering box, operating twin gears independently attached to a drop arm for each wheel.